Holyoke - as we know it - was built in the late 1880s. It was the first planned industrial city in the country. It's dense urban core and three-level canal system were built around a 60 foot drop in the Connecticut River to power INDUSTRY! INDUSTRY! INDUSTRY! Holyoke's tight street grid wraps around the broad canals, following an elegant curve in the Connecticut River. The ingredients that made Holyoke a great city - renewable water power, a dense urban core, and GORGEOUS mill buildings - remain. Open Square donated a tour of the canal system as a silent auction item for a local fundraiser. Please join us on the tour! But first, please put on some really unattractive footwear. Open Square operates two water wheels - producing 1/2 a megawatt of electricity. 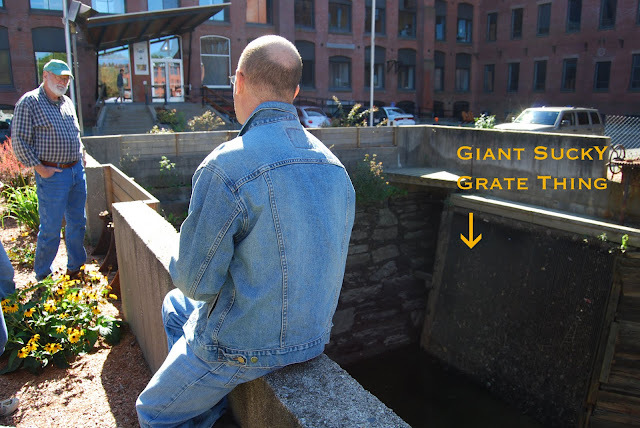 Twice a year, Holyoke Gas and Electric (HG&E) drains the canals for maintenance. The photo below shows an empty headrace with a safety grate exposed. 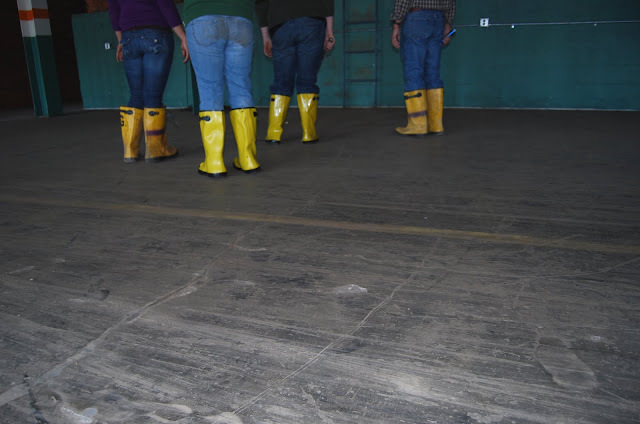 With Boots on our feet, flashlights in our hands, and cameras at the ready, we ventured down into the raceways....in the next post! stopping by from sits! hope you have a wonderful week! Thank you for stopping by my blog this morning. Now it's my turn to return the favor. happy sits day!!! i'm a new follower & can't wait to keep seeing all your projects! I love learning about local history and buildings! Owned a Victorian on the upper end of Oak St. and the pocket doors had the same brass trim as in your photo. Had grape vines around the house and the back yard was full of fruit trees. Was a big place with 4 bedrooms upstairs and summer and winter parlors, dinning room, butlers pantry and kitchen on the first. My daughter and I still talk about the good ole days at the Oak St. house. Wisteria Hurst was a favorite destination then and walks through the beautiful cemetery at the top of Cabot in the summer. I visited the place a couple years ago and it hadn't changed much, still looks great from the outside. The cultural change in Holyoke finally prompted us to sell but it was a hose we will always remember fondly. I love the name of your town, and I like your blog! I will be a frequent visitor! I lived in Holyoke from Jan 71 through Jul 75. My husband still has friends and family living in the area. Your blog brings back memories. GIANT SUCKY GRATE THING? Where are the Pulitzer people when you want them the most? I once was down there..it seemed to be more of a large metal filtering system.